No matter how deep you bury the bodies, their ghosts linger in the very concrete of a city. Al Harris’s actions haven’t gone unnoticed, and not all that attention is good. There are some people starting to worry the next cold case Harris solves will be one they’d rather stayed buried. After being questioned by a couple of mysterious men, Harris comes back to find his office in ruins and Judy attacked - and all his case files stolen. Now he’s got some questions on his hands: What is it about those cases that is so important? What is being covered up? And who is behind this attack? The resulting investigation will take Harris away from the small towns he’s become accustomed to and back to the city of Chicago. The famous days of Al Capone and the Untouchables might be over, but the mafia still rules Chicago in its own way, and Harris is about to find out for himself just how alive and kicking they still are. Some of these powerful mob families go back decades, as do their sins. Hal Harris a a cold detective as stated in the title. He is very good at his job. Perhaps too good. People are taking notice of the cases he is working on. He come back to the office only to find that his office had been ransacked, files taken, and his secretary had been attacked. He had to find out who did this. Enjoyed the book greatly. The narration is very good. Brought he characters to life. A good story but it ended abruptly. Felt unfinished and left me hanging there. John C. Snipes did a good job narrating. I was provided this audiobook at no charge by the author, narrator or publisher in exchange for an unbiased review via audiobookboom com. This is only the second book in the series I've read, but I now want to go back and listen to all the books I've missed. I listened to book 7 and this one picks up just after 7 finishes. I really liked the structure of this book, it drew me along with the detective and kept me interested. The character interactions are amusing especially Al and Judy, but really Al seems to have a knack for annoying everyone he meets while being very effective in solving cases. A great short book to listen to, the narration works really well, good pace and tone and great character voices. This is the first book by Rob Costa that I have listened to. This book is both a standalone listen and part of a series. I enjoyed how Hal solved the cold case by noticing that others were interested in it. He would have ignored it had they not shown interest. Typically I listen to Romance books, so this one being more “hard boiled detective “ was outside typical genre. The story is fast paced and the narrator, John C Snipes did a good performance. I requested this review copy audiobook and have voluntarily written this review. I would listen to more books by both the author and narrator. Concrete Graveyard A Detective Al Harris Cold Case, Book 8 - It is the first I've listened to in the series, a bit lightwieght but that comes with the territory of being a novella (68 pages in the kindle edition). That said it is a good short story and I will read/listen to more of this series. Perfect for people who like shorts. Narration and audio quality are good. 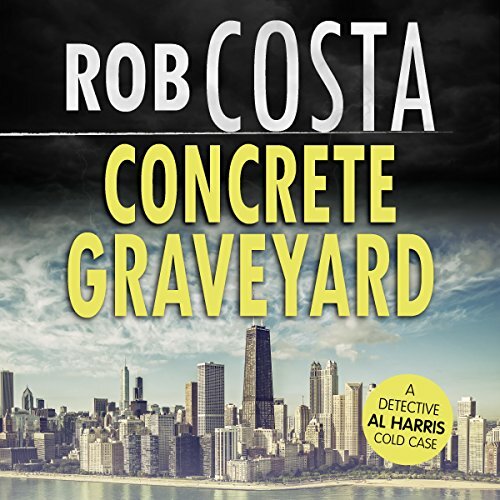 Concrete Graveyard ( A Detective Al Harris Cold Case Book 8) was another great read by Rob Costa. There are people that are starting to notice the cold cases that Al Harris is solving. They are starting to worry that their cases may be looked into next. Al's office has been ruined and his secretary being attacked. I enjoyed this book and can't wait to read more of Al's stories. It's difficult to quantify if this is supposed to be an hard boiled detective tale, the main protagonist certainly is, or a comedy. Certainly, secretary Judy is a good injector of humour with her mother hen act. But whichever it is, this is an enjoyable read. Al Harris, the ex detective turned P.I., works cold cases. When threatened by two men, demanding his case files be surrendered to them, and the his office is searched, his secretary knocked out, Harris is more determined than ever to look back 30 years to find out why such interest is now being generated. Could the Mafia be involved? Narrator, John Snipes, makes an excellent Harris, his deep, gruff voice feeling very appropriate. His delivery is brisk and slightly clunky, again suggesting the humour beneath the investigation. This is a short story, stand alone although it does build on it's predecessor, a little quirky and very enjoyable. My thanks to the rights holder for freely gifting me a complimentary copy of Concrete Graveyard, at my request, via Audiobook Boom. I look forward to future encounters with the cold case private eye.